After transferring 420 years of north pole position data from the NOAA Geo Data Center, configuring it to fit in an Excel spreadsheet, adding a complicated formula to determine exact distance between 2 sets of latitude-longitude coordinates, applying the formula to each data point in the series, and then finally plotting it all in a visual graph, it is alarming to discover the amount of magnetic pole shift – just over the past 10 to 20 years. Since 1860, the magnetic pole shift has more than doubled every 50 years. That is pretty significant. In geological terms, that seems to be pretty ‘rapid’. During the past 150 years, the pole shift has been in the same direction. During the past 10 years, the magnetic north pole has shifted nearly half of the total distance of the past 50 years! In other words, the pole shift has apparently sped up substantially. The present rate of magnetic north pole shift is about 55 kilometers per year. According to the data set, during the year 2000 the magnetic north pole actually shifted more than 70 kilometers. The issue now is, since the pole shift has been at 400 year record high rates during the past 10 to 20 years, the cumulative effect is now beginning to cause real-world issues. Will the effects affect us noticeably or in a bad way? Time will tell I suppose, but at the current rate there will no doubt be direct effects on many systems in the years ahead, many of them nuisance issues such as documentation changes while others will likely be more serious. It is not known if the shift will speed up or slow down in the years ahead. Some say that a pole reversal is overdue, and this phenomenon may be indicators of the beginnings of that process. At the current direction, the magnetic north pole is heading directly towards Russia. The following image shows the dramatic acceleration while pointing out the past 50 years versus the past 10 years of movement. Update: March, 2012 – NOAA has just changed (massaged?) their data of the past decade. Appreciate topics of survival, preparedness, risk awareness – or planning for disaster? How was the magnetic pole location measured accurately in 1590? @Jasonn, the compass was known to exist as far back as 247 B.C. (evidence in China). The data set used in this post is from NOAA, who use a variety of modeling methods. Apparently some (or much) of the very old data was obtained from records kept on ships during that time (ships logs). They do not mention the accuracy, but for the purpose of illustrating the pole movement over the centuries on a large scale map, I doubt that accuracy error would be discernible. Data further back than records allow, is collected by looking at the alignment direction of certain rocks and minerals. Where is the N Pole headed? @Yadidah, I just added a new image showing the eventual destination if it keeps on the same course. THE POLE SHIFT IS ONE MORE MOVEMENT TOWARD THE COMING ICE AGE. IT WILL AND IS QUICKLY MOVING. TEN YEARS INTO A FULL SEASON THIS EVENT WILL LAST 90,000 YEARS GIVE OR TAKE A FEW YEARS. THE COMMEND RECURRENCE OF COOL WEATHER HAS TOUCHED THE EARTH THIRTY (30) TIME OVER THE PASS THREE MILLION YEARS (3,000,000). WHERE-AS, GLOBE WARMING ALSO COMES BETWEEN THE ICE AGES. WARMING LAST ONLY TEN THOUSAND YEARS GIVE OR TAKE A FEW. Geomagnetic north and axial north may coincide in a few years due to the induced temporary slowing of planetary rotation speed by suggesting atmospheric movement contrary to historic norms. You could tell where the north pole was in 1590 by where Santa’s house was and the north pole is heading south, where else!!! If it was 70km/yr in 2000 and 55km/yr today, then isn’t it slowing down? The article is from 2005 but I think the theory has not changed since then and this is what we’re seeing now. She gives many links at the end. it includes the entire S. America and part of S. Africa. Big question IMO is: *what* is causing this? Warping or bending of the flow of magnetic flux can be caused by the gravitational pull of or magnetic flux of other planets or stars. We are a little over a month away from our Solar System aligning in the center of the Milkyway. It is possible that we will see a very rapid change in polar position. The Sun ‘flips’ in a similar manner…. I am proud to say I am NOT metric and never want to be. Can you put American conversions in parenthesis. I know once we have global government we’ll all be metric, but pacify me for now. I have tried to follow the movements of magnetic north for many years and have been frustrated over the lack of current information. I realize that MN is in a state of constant movement, but a lot of websites are 10 years old and still have it located in Canada. Yours is a most informitive site. As close as I can tell the latest location is around N. 85 – W. 130. in a few years where I live in Alaska Magnetic North and the North Pole will line up and declination will be 0. That will make map and compass reading pretty straight forward. (No pun intented) Ed in Alaska. this year and it will be *more 12 deg West* in 2015!! It’s an unbelievable acceleration indeed. I wish we could know better the cause of this! I’m not inclined to believe in “random variation” of the Core movement as we’re too on spot for the 2012 date for all this to be mere coincidence. which have also increased in recent times, since the end of last cycle(#23). Both “anomalies” are happening at same time and both correspond to *lower intensity* of the magnetic fields. central magnetic axis]…” (of the Galaxy?) and during this period we cannot see the Sun. According to D. Alejandro this happens every 5200 years. I believe there are greater cosmic reasons for what is happening now. You are already under global governance and from what i have seen it is the cause of every constitutional violation. Ordinance in your state is being written for the UN. Just not marked or named. IF you ever wonder where stupid ordinance comes from , need only look to the UN.Our republic is under siege by a foreign gov! O K here it goes, Please update if you can. As a valcano ejects “liquid” lava the iron elements are in a liquid state. As lava cools the iron elements align themselves to the magnetic north. The iron elements in solid lava are pointing to magnetic north at the time the lava cooled. Once you know when the lava was liquid ( valcano blew up) they can figure where magnetic north was. I think this is called lava magnetic lines. Now that I read my own comment I realize they could go back forever even to determine pole shifts. Does this mean that Santy Claus has to move? There is also a direct inverse relationship between the strength of the Earth’s magnetic field and the distance between the magnetic and rotational poles. (The magnetic field also drops off exponentially as they approach). 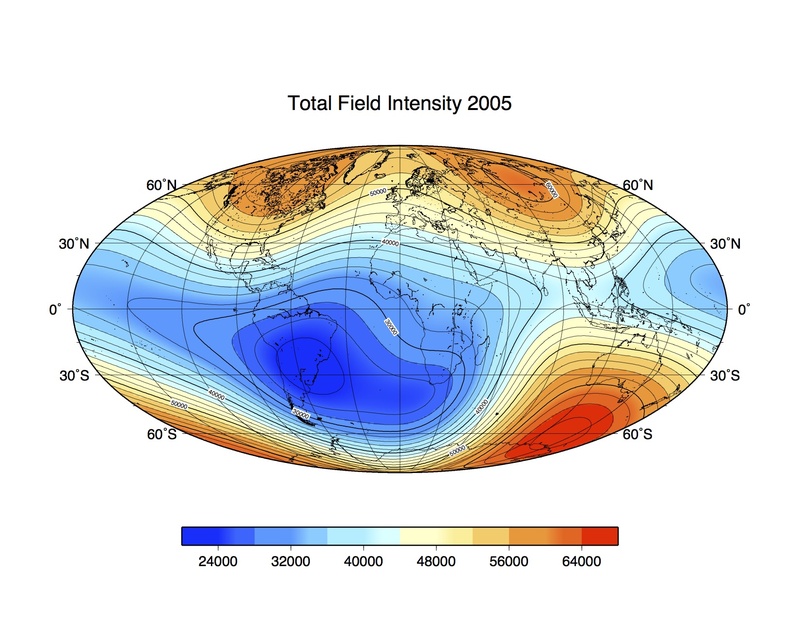 According to trends, the Earth’s magnetic field will reach a minimum around 2018. It would be great to also include magnetic field strength with this motion data. As Americans, we must take the lead on this, and DO SOMETHING about it. I suggest a “magnetic footprint” tax be formulated and collected from all Americans. Seriously though, I don’t know what to make of it either, other than to suspect that it is one more thing to be alarmed about, that we can do nothing about. Too much science CAN be a bad thing, perhaps? I believe I can gather from the article that the pole has shifted every year – for billions of years. If it speeds up or slows down for a period as miniscule as 421 years, in comparison to billions of years of earth history, well then… I don’t count that as scientifically accurate, significant, or complete. And if it is, what can anybody do, except suffer the consequences and adapt, or perish? The earths magnetic poles have shifted hundreds of times without any evidence of global catastrophy. Anyway you can never reach true magnetic north. Ask any Arctic explorer and they will tell you it moves faster than you can run. 7 degree wobble and its inconsistancy equate (no pun)to approx 10km – 70km per year which fluctuates throughout time. There is direct correlation between this and global climactic fluctuation, or taxable co2 man made fluctuation if you prefere. What about snow samples taking in north pole, i read that some millions of years old snow they are drilling and researching. Nowadays i heard dramatic north pole shift happens several times in 700000 or what ever. So how could snow survive? Probably something wrong with this theory, like with man made global warming. We put 13000 satellites around the world, everybody is a scientist and everybody rush to make some statement and cash it. I believe that it shifts and back shifts and back like summer and winter. Magnetic pole movement is independent of the geographical pole. No-one can accurately map previous movements, we simply do not have accurate records, but there is apparently some evidence for a relatively recent “flip” 41,000 years ago. There was a rapid flip at that rime that lasted approximately 400 years. You mean the tampa bay airport changes? Interesting but not as interesting as the denver airport mural???. ps geology was around during pole shifts even if we were not. @Nemesis, You are right on about the Denver airport murals – pretty freaky. I’ve read about that (and watched a few YouTube videos about it), and had planned to start building a post about it. I heard that the murals at Dener International Airport were painted over? Anyone know if thats true? @Ken, Im just playing devils advocate here and probably just trying to reassure myself. your data is impressive and I will keep updated. ps my sat nav at work is way off the mark in lt 2 wks. any connection? 1. Direction of real north within 43 minutes of angle. I’m curious, how many people knew Polaris gives latitude? It is part of celestial navigation knowledge. Santy Claus won’t have to move cause he has a secret underground base constructed long ago by the aliens, with multiple secret entrances planet wide. How do you think he does that delivery thing? Rudolph is just a code name for his faster than light spaceship. The ‘reindeer’ are his crew. And not to be a smartass, or more than I already am, my ancestors, poor farmers and working class no-bodies, survived just fine without a compass. Some of them probably barely knew what one was. They only had to know how to get to the garden and the outhouse or where to find the cow, if they had one. Not a way of life I look forward to exploring. There’s nothing wrong with prepping for what may happen. But we know for sure if we don’t take our government back we will all be full-blown slaves. It’s time to stop hunkering down for the apocalypse and prepare for what will be required to restore Liberty. It’s time to think Normandy. I love all these comments… Interesting and Informing. I just want to add that this shift is called Polarizing… The geodetic lines and Earth grid will change and this will affect us globally, but like our indigenous ancestors who survived past cataclysmic events to have us existent today, we should follow suit and use our pro conscious creativeness to prepare. Despite that I have only been on this Earth for just over a quarter century.. Just to know that “things” inevitably change is how I know to accept such change and polarize. The Mayan Calendar predicted rapid change during this time. Perhaps studying the Mayans will provide answers. Apart from being a spelling nazi, I am glad to have found this site. I am a retired Ph.D. and my hobby, When I have a break from my effort to become self-sufficient, is climate change. I might be able to contribute. You are wrong! We are IN a REAL geographic Polar Shift!! The axial shift is taking place as we speak! I’ve lived in the same place for 45 years and the sun does not rise and set in the same places that it used to! That is an undeniable fact! The tilt of the northern hemisphere toward the sun during the summer is far greater than it used to be! Use your own situational awareness and you will have to agree! That is what I am seeing a lot online. I personally know things are different and look forward to what you and others are sharing. We ARE in for a ride! 1. Kick a ball having heavy free item inside and watch how it curves, seemingly erratically – but still under strict (very) complex rules. 1 + 2 = This magnetic shift proves loose issues on the move. As they move beyond tripping point, the axis will eventually flip. Question is when. Yes, big ride for us. And also ‘the ride’ we have been promised. Contrary to the jesuital pancake lies: “Earth is round, rotates once a day, while running its spiral course” said the prophet 4k yrs ago … (try formulating the 3D trajectory for one point on earth – it is spiral). If the axis were to tip out of the earth would it appear as a huge red and gray bar magnet? And would we be attracted to it like little iron filings?? I seem to remember that as sea bed rock is laid down in the Atlantic trench from magma that when it cooled its internal magnets were pointing in the same direction as the magnetic pole of its day. That’s how we know that the pole has moved and even reversed many times in the past. So perhaps, they also worked out where Santa Klaus was all those millions of years ago, from all those ity bity magnets. @Anonymous, You are correct regarding the magnetic orientation of magma as it cools. There have been a few discoveries of apparent astonishing speed of an instance (or a few instances) of magnetic pole shift. The findings are disputed by some, but not all – as is sometimes typical in the scientific community. lol re: Klaus. Such a swift movement of the North Pole could be electric. Cause and effect. We have a relationship with the sun. So do the other planets in our solar system. What is effecting the sun is the larger question that answers what is effecting our magnetic alignment. The sun has cycles, and our planet responds to those cycles. What cycle is the sun going through now? And, is that cycle normal, or abnormal? All the other planets are heating up, so are we. Things are getting hotter, and things are starting to move. For me, there are only a few theories out there that support the scattered data. I dont like it, and many laugh at the idea. But, truth is stranger than fiction. I knew we couldn’t trust those Poles. Magnetic pole reversals are natural phenomenon that occur on average every couple of hundred thousand years. The last reversal was over 600,000 years ago. The magnetosphere protects the earth from the sun’s ionizing radiation and alpha particles that are directed at earth by collecting most of the radiation and concentration it at the poles which in turn generates photon releases as a Borealis. Three of three precursors to a pole reversal are under way. First, the overall magnetic field has decreased in strength at a rapid rate over the past hundred years. Second the pole shift has accelerated and finally magnetosphere apertures have occurred. A recent model of the pole reversal process shows random apertures in the field occurring before the reversal. These field apertures are like dead zones to the magneto perceptive animals that rely on the field for navigation. In the past three years, an increased incidence of animals with magnetoperception have perished. For example, mass bird deaths in Louisiana and arkensuas that died from apparent asphyxiation. Conclusive studies have shown that magnetopercetive animals that also have ability to sense magnetic inclination to navigate and maintain altitude become confused when they encounter gaps or sudden changes in the magnetic field. In essence they fly beak first into the ground or fly too high and they suffer hypoxia. Most species of fish and other aquatic mammals such as whales rely magneto-perception to migrate. The mass fish deaths of sardines in california and other fish in the Chesapeake may be evidence of magneto-apertures causing confusion in the birds and fish. My final comment is a possible correlation between corronal mass ejections as X class solar flares and the complex geological processes on earth. While we are headed toward a solar Maxima in 2013, an X class solar flare with an R3 rating occurred just two days prior to Japan’s deadly earth quake. A similar X class R3 flare occurred just days before the Christ’s Church quake. I believe the R3 event was enough to cause Boeing to recommend grounding over 115 Boeing 767’s (fly by wire aircraft) that rely on precise GPS positioning and radio altimeters to safely navigate and land. It is possible that these energy releases directed at earth induce enough energy, magnetic and gravitational fields into our Earth’s core to nudge a subduction plate to break it’s static friction? There is a big difference between the rotational axis and the magnetic poles. There does not seem to be any evidence put forth establishing a rotational axis shift which, if it were to happen, could be catastrophic; on the other hand, a rapid magnetic pole shift would seem to more likey to adversely affect mammal, bird and insect migrations, in addition to man-made systems. Oh but there is . RSOE EDIS site from Greenland reported sun rising 2 days early. Note the tilting of the moon from it’s previous position. Its not the moon but the earth that has tilted though you ain’t seen nothin yet!! The phyical mundane elements are slow and always follow the invisable changes such as the recent magnetic poleshift. Of course the physical earth will follow suit. A simple experiment is take two magnets and create a N and S poles on a table. Iron shavings will react to the invisable changes to the shift you make. Russians made note of the palm trees, sago palms, and wooly mammoths that had vegitation they were eating at time of last ploeshift. Politicians, presidents and journalists have been telling us, for years, that Black is White. Millions of people have been killed because of our accepting what we’re told on television as being the truth. Enemies have been touted as Friends; Friends as Enemies. Now why would be worry about North being South? To the person that wondered if we can in fact trace back every past magnetic pole shift. Yes, using various techniques of measuring remnant magnetism; and it has been done (and re done as new evidence is discovered). These measurement techniques are also one of the many ways that impact craters are evidenced. There also hasn’t been found to have been an increase in “deadly” radiation when these have occurred. I’m sure that if humanity survives itself (let alone any external force), we’ll experience another. And let’s not confuse this with the rotational shift, which is itself postulated to be occurring continuously as the continents form and break up. Just an observation — Could it be just a coincidence that most of the world’s oil is drilled in the northern hemisphere and the northern magnetic pole has slowed down? what are your predictions on the pole shift? how will the earth change? what locations will rise and which will fall? and by how many degrees? and if you can what is your estimated date when this event will take place? I work for a company that requires current magnetic north position for drilling. Important to note that the magnetic north moved 120 miles between Jan. 2011 and June 2011. Last year there was in the area of 42 miles total movement. Do you know if it has even become faster the last months of 2011? The magnetic poles are simply the rims of gigantic 1,000 plus miles wide holes. The ACTUAL physical geographical poles are moving. Or, rather,at present, just the north geographical pole is. Taking the magnetic north rim with it. This is due to the sun going around one of the spiral arms of the group of stars it is in. Creating a centrifugal force which is pushing The Earth over, pivotting from the south pole(not the centre of The Earth, YET) This also explains why the south pole is not(at present) following suit. You guys also need to realize that(According to one R.C. Priest, Peebles) our Gregorian Calendar is 3 years too advanced! In other words it is now 2,008 A.D. not 2,011! Thus giving us another 3 years to be added to time until Dec.21st; 2,012! What is moving is the physical geographical pole(taking the rim of the hole with it, of course). This fact is complicated by different points on the rim being registered according to which part of the rim is nearest the observer. Can you please tell me where actual position data of magnetic north pole are listed? Do you have data from Jan. 2012? However the group of pages that contained that data has been taken down. I am planning to search for a new set of numbers for a future article though. Ok if this is really going on in the world today, where do we go to be safe, something to think about. Don’t imagine any location safe until things would settle down. General survival skills, supplies, and plans apply. Best idea is to keep yourself from becoming one of the many dead. Yes indeed, Magnetic North is shooting off towards Russia. Currently. . . . . but watch it pull a fast U-turn and head back towards Canada. Oh boy, watch everyone’s eyes get real big then. I’m far from a scientist but with the south pole lagging behind, when it finally snaps to equilibrium, would the momentum fuel a more rapid pole reversal, maybe even past the new pole for a time/ Does that make sense? Read “Worlds in Collision” written by Velikofski back in 1954. No, he was a scientist not a sci-fi writer. Not sure I have the spelling right since I read this book as a geology course requirement when I was in college back in 1970. None of this is new or nor is there a secret Government-Illuminati-CIA-FEM-Masonic-Alien conspiracy. The historical evidence is clear as is the archealogical record. Polar shift has happened before (recently between 4000 and 10000 years) and will again. When it happens, it will be cataclysmic not amount of MRE’s or guns or Coleman lanterns will save you. Nor will hiding in a FEMA built cave. I’ve never seen what a wooly mammoth has had for breakfast but personally have seen sea shell fossils at 7000 feet in New Mexico. Why do think all the ancient civilizations were so interested in astronomy? This is a very beneficial site glad I found it. Thanks guys! I have a magnet hanging from my bedroom fan lamp and noted the direction of its hanging. Yesterday – it has changed direction pulling westward. Is this an ominous occurrence? It was not a subtle change – but something that was large enough to make me uneasy. A magnetic compass can change direction if influenced by a sufficiently large metal object nearby. In your case, it is also possible that whatever you’re hanging it from has been affected in some way. Have not heard of any sudden magnetic anomalies. Sea shell fossils are not unusual at large heights like 7,000 feet. That just means that at one time they were at sea level (0 feet) and on a land plate which was pushing into another plate. Both plates pushed each other upward very slowly, forming a mountain or mountain range, until later the sea shells were seen as a fossil at 7,000 feet. By this time, the shells were long gone but the imprint of them was still there and we call that a “fossil”. yes as a child traveling through the western states during the 60’s we found fossils at 7000 feet. And i do agree that the theory of the shells being at o elevation or sea level at the time is correct. however, I must aggree with great north woods also. because ussually it takes one techtonic plate slipping under another to get that mountain of elvation(7000), no eathquakes no mountains. question then is what causes earth qaukes? I seems it could be all of the following; gravity magnetic influences. rotional stresses solar influence or even dark rifts or large space objects with density unimagined. I agree with both diane and great north woods. which came first the shift or the mountain the chicken or the egg. just wondering myself, nice site glad i found it too. lots of thinking people out there still. stay awake, keep your faith make the best of a bad situation if it comes. show you care for others, keep the aloha alive no matter what may come, lets hope the great spirit will bless and keep us all. Don’t confuse polar shift with geomagnetic shift. You all have internet if you’re reading this. So check the wiki, nasa, and noaa sites if you really want to know what’s up. This rate of shift seems fast relative to a 400 yr s scale but not in geological time. Yes, the references in the article are to ‘magnetic pole shift’, the place at which our compass needle points… Good clarification though. Hi all, I know these figures are not at all accurate, they are a simple few equations explaining the rate of increase the north pole is moving to how long it would take to become the south pole. Earths Circumference is 24,901.55 miles. half way around is 12450.775 miles. Current North pole movement 40 miles a year. So 12450.775 divided by 40= 311.26 years to flip at current rate. Old rate of movement, 10 miles per year. So the speed has quadrupled in half a century. So, this will continue to exponentially rise? A rise over the next half century if quadrupled will be around, 12450.775 divided by 160 miles = 77 years until it reaches a a full flip. People have to understand that World changes, doesn’t matter with humans or with out them. Here’s something to ponder. Pole reversals take hundreds or thousands of years to complete. Some time during that period the earth’s magnetic poles will be perpendicular to their current position. Currently the sun’s and the earth’s magnetic poles are more or less parallel. The magnetic field surrounding the earth is therefore perpendicular to the solar wind. A small portion of the solar wind’s charged particles gets captured at the cusps of the magnetic field and the magnetism funnels the particles toward the earth, generating the auroras. But if the earth’s poles are perpendicular to the sun’s poles the earth’s magnetic field and the solar wind will be parallel and the magnetic field will not be deflecting most of the charged particles but actually gathering them and blasting them down to the surface around the earth’s equator. That’s an over simplification but it gives an idea of one of the possible ramifications of a polar reversal. from the article: “At the current direction, the magnetic north pole is heading directly towards Russia.”….QUESTION: it is my understanding that it’s the “SOUTH magnetic pole” at the geographical north pole. So, given that; how does the “magnetic north pole” head toward Russia?